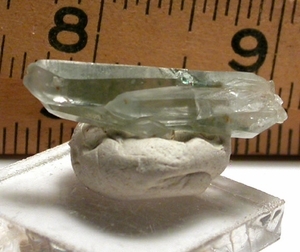 Arkansas multi-terminated penetrated green phantom crystal, has a rainbow. One of two doubly-terminated riders also has a pleasing dark celadon green phantom as well. Held to be healing and grounding, these are overall 3/8x 1-5/8"long, the riders 3/4" and 1" long respectively. Sized just right for making a fine small pendant. No damage.